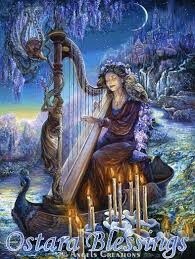 Ostara is the Goddess of Spring and of the Dawn. Her name, which in German, means “movement toward the rising sun”, is also used by some for the Spring Equinox. Legend has it that Ostara found an injured bird. In order to save its’ life, she transformed it into a rabbit. The transformation was successful in that the rabbit survived, but it was not quite complete, as this rabbit could lay eggs as if it were still a bird. In gratitude, the rabbit would decorate its’ eggs and leave them for the Goddess. In Anglo-Saxon, her name is Eostre or Eastre. Her name has lived on in the holiday of Easter, another Spring holiday, which is also about resurrection and rebirth, if not of the Earth, but of hope and renewal. 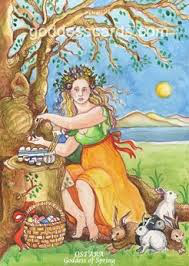 In this way, the Goddess Ostara is celebrated from the Spring Equinox until Easter. This Goddess is about the returning light and warmth; and the Earth’s abundance as it is reawakened and reborn. Eggs, rabbits, flowers – all symbols of fertility – all first signs of spring – are sacred to Her. Ostara’s symbols also became the symbols of Easter, which came much later. Rituals to Ostara would include seeds, what you wish to grow and sow; planting a garden; coloring eggs and leaving them outside for the animals who are coming out of hibernation; taking a mindful walk, noticing the Earth as she begins to come out of her slumber, breathing in the freshness of the air, listening to the songs of the birds and the buzz of insects, feeling the sunshine. 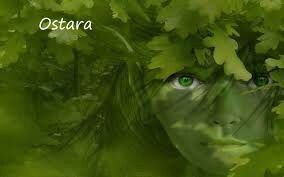 May you all be blessed by Ostara this Spring!